I added the microbes (the green ones are fungal spores) myself, can you tell?! When you play a wind-driven musical instrument, be it bagpipe, harmonica, brass, or woodwind, you're potentially doing two things: (1) creating an enjoyable sound, and (2) being exposed to microbes present inside the instrument or its mouthpiece. The latter, which occurs as you breathe in with the mouthpiece close to your mouth, can occasionally result in health problems. These include mouth and throat infections (e.g. cold sores and strep throat), which tend to occur at schools where inadequately decontaminated instruments are shared between students, as well as a lung disease known as hypersensitivity pneumonitis (HP). Let's focus in on HP. In addition to rashes and runny noses, allergens (substances capable of tricking your immune system into freaking the heck out) can cause your alveoli (tiny bags attached to the smallest branches of the inverted tree that is your lungs) to become inflamed if you breathe them in. People afflicted with HP generally can't breath particularly well and do a lot of coughing. They also may feel generally crappy all the time and slowly lose weight. There are many allergens (e.g. microbes, plant and animal parts, and chemicals) capable of causing HP. They tend to lend the particular form of the disease they cause its own descriptive name. For example, isocyanates are responsible for chemical worker's lung, while inhaling dried bird crap can cause bird fancier's lung. In the case of musicians, two types of HP are known. 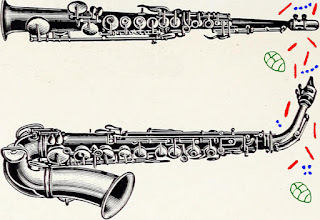 Saxophone player's lung (sax lung) was first reported in 1988. The illness was attributed to the growth of yeasts of the genus Candida in the player's mouthpiece. A second case report of sax lung was published in 2010. 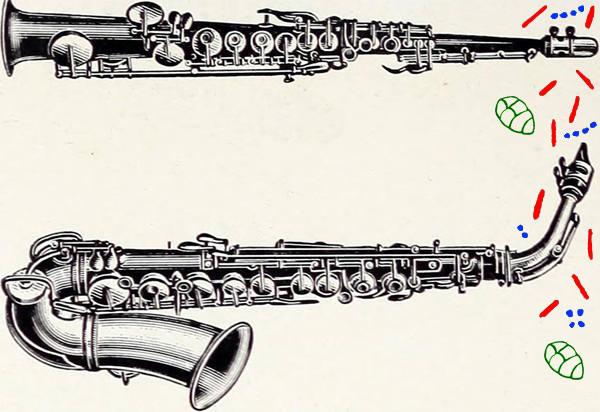 In this instance, the HP was traced back to two moulds, Ulocladium botrytis and a member of the genus Phoma, which were found hanging out in the mouthpiece and body of the saxophone. When they aren't setting up shop in saxophones, these cosmopolitan fungi are found infecting plants and releasing their spores into the air around us. The authors then decided to look at 15 saxophonists and their instruments, and discovered most of them were colonized by potentially harmful fungi. Trombone player's lung was first mentioned in 2010, in the same journal issue as the above sax lung case report. A professional trombonist reported having consistently coughed for the last 15 or so years. Can you imagine, 15 years of coughing?! An investigation of his mouthpiece revealed it was contaminated with lots of bacteria belonging to the genus Mycobacterium as well as a couple of other bacteria and moulds. Mouthpieces and instruments are able to grow microbes because of the heat and spit (i.e. water and food) introduced by a musician as they play (microbes love warm and moist places). In all three cases, the musician recovered (even 15 years of coughing dude!) after they began to regularly clean and disinfect their instruments and mouthpieces (e.g. by soaking them in isopropyl alcohol). The relative rarity of these illnesses suggests they only occur with high long-term exposure to a particular group of microbes. Since a hallmark of HP is having breathing difficulties, it's a particularly lousy illness to come down with if you're a professional musician who needs healthy lungs to work. In the reported cases, players felt better when they stopped playing for a while, and felt worse when they played more often than usual. Thanks to lung-inflaming microbes, they were inadvertently harming themselves with their own instruments. Marshall B, Levy S. 2011. Microbial contamination of musical wind instruments. International Journal of Environmental Health Research 21(4):275-285.